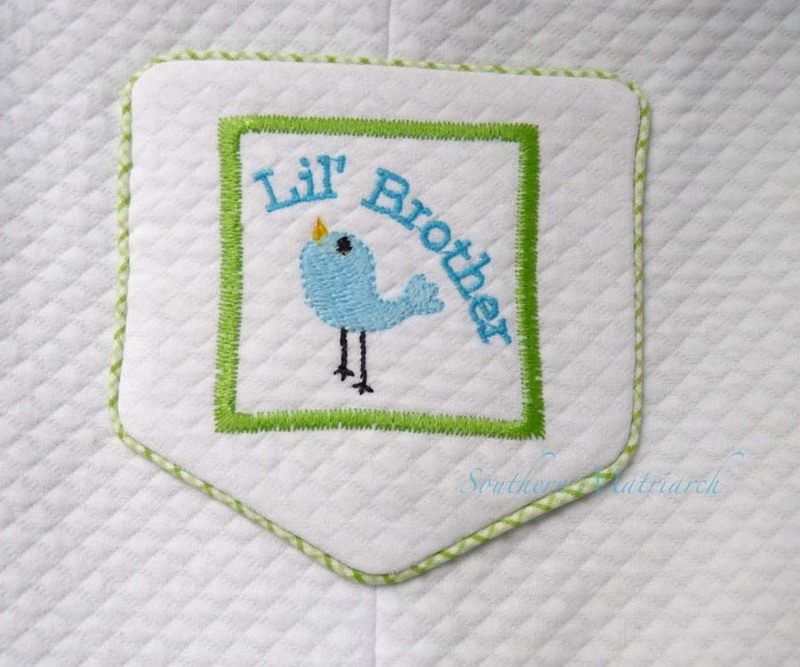 Baby brother is only a few short weeks from arriving. There has been one thing after another keeping from my sewing room. 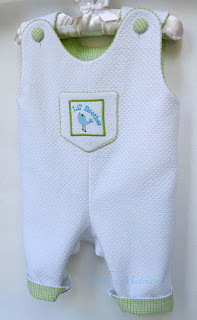 Consequently, his layette is woefully bare right now. I am trying to squeeze a few more hours in my day. I'll let you know how that works out. I am fearful it won't be as successful as I hope. All that aside, here is his first completed outfit. 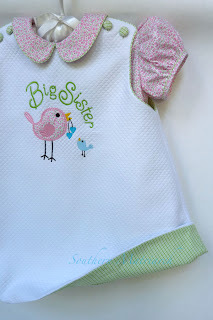 Mommy wanted outfits for when "Big Sisser" comes to see baby in the hospital. Looking for some of those Kodak moments. We went stash diving and this is what we came up with. The jumper is Children's Corner "Lucy" paired with an out of print pattern, Children's Corner "Meg" for the blouse. 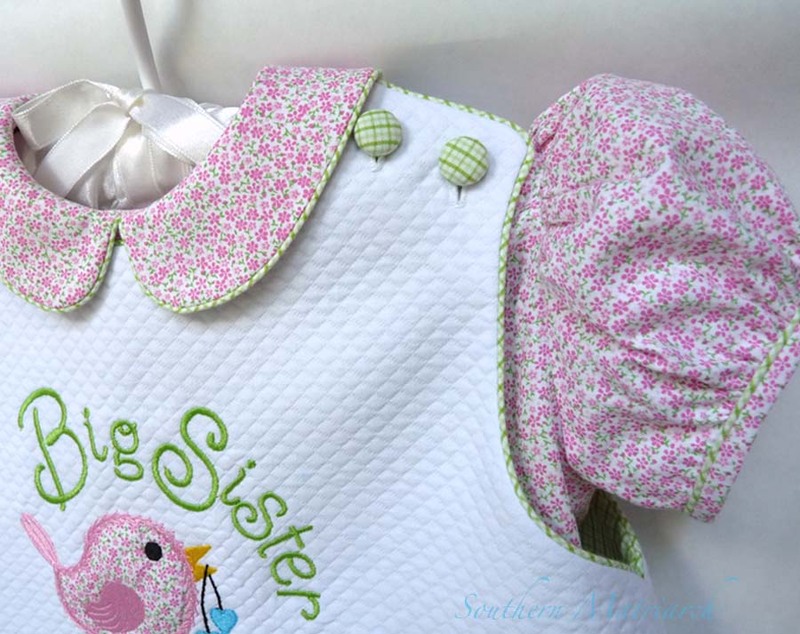 Both outfits are made from Spechler Vogel Dakota pique, and lined with Fabric Finders green tri-check. Since Princess is a tall drink of water, the jumper is a size 2, but with a size 1 armhole. It fits great, it is a teeny, teeny bit long but won't be for long. At 14 months she is 32" tall. It is piped in the tri-check. You know I love piping. It gives such a nice finish. The blouse is a Fabric Finders floral cotton. It also comes in a sweet blue colorway, but that wasn't in my closet. Mommy wanted the sleeves piped as well. The buttons are 1/2" covered buttons. I did interface the fabric to cover the buttons with, with German interfacing to give the fabric covering a bit more stability. Baby brother's outfit is made from Jackie Clark's "Baby Overalls". As I said, also from the Dakota pique lined with the tri-color check. I used Snap Source snaps at the inseams. I couldn't leave off the piping love from baby brother, so it too is piped with the green. 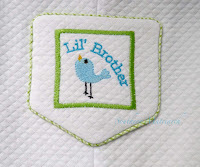 Initially I was going to do the machine embroidery on the romper front without the pocket. I decided to line and pipe the pocket to frame the embroidery instead. This pattern called for a rounded strap so I used one larger covered button instead of the two smaller ones. 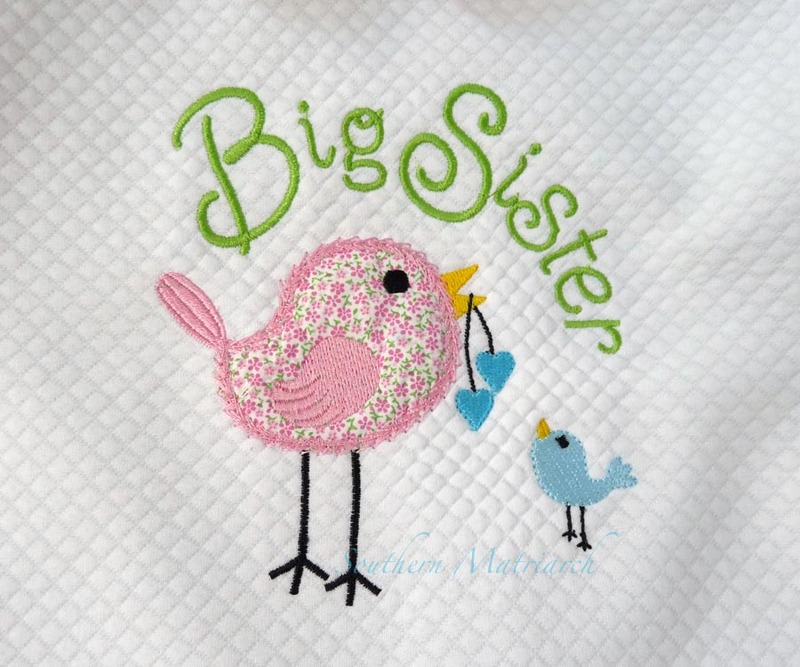 The Big Sister design was purchased from swak embroidery while the Lil Brother design was a free download from the same site. All in all I call this duo almost "free." 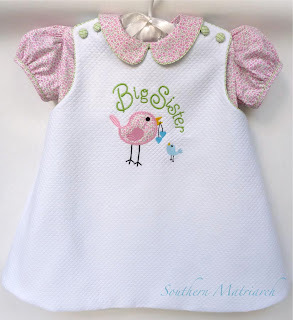 I had the fabrics and the patterns, the only thing I purchased was the buttons for the blouse and the Big Sister embroidery design. Score! Parting shot: Princess in a bishop from last fall at the punkin' patch this past weekend. It still fits, but it is too short now. Mommy just slipped a pair of jeans underneath. And no, her bow isn't quite that large, it is a tee-pee in the background! I love the brother/sister outfits. I see a future for you!! Double the sewing. Half the time!! These outfits are absolutely darling! I love the check piping. I hope you get some nice pics of smiling big sister with her baby brother. The outfits are precious. Love all the details: piping, buttons, embroideries! So very cute!! I hope you get princess to pose with her new brother. The embroidery is darling. What font did you use? 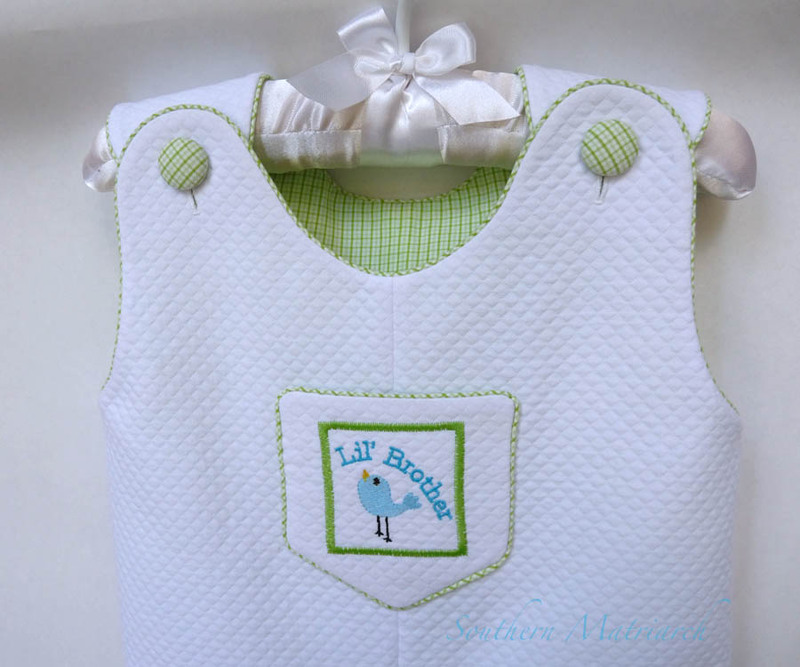 It is perfect for kids clothes. Spectacular! They are so perfectly matched--with equal detail and interest, and yet so gender appropriate! So crisp and fresh and.....just plain darling. How cute, cute, cute!!! Having a second grandbaby changes everything!! LOL I went from sewing for one to sewing for(or trying to)three!!! Number 10 will be here in March!! These two outfits are gorgeous, Martha. 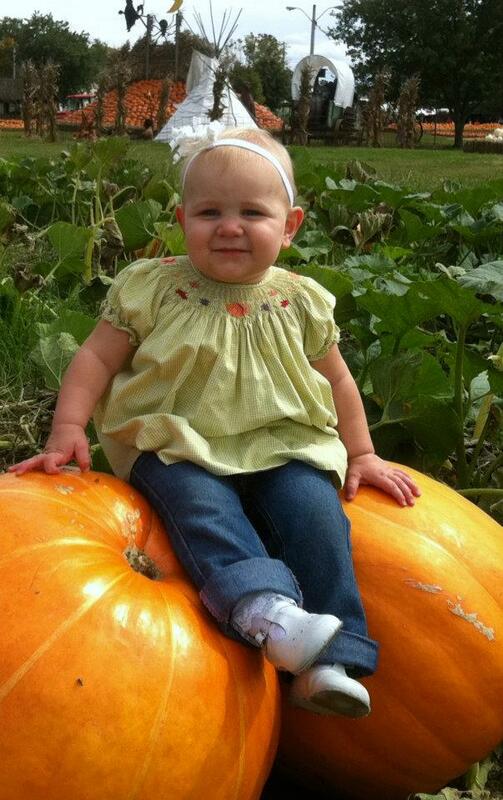 I am loving Miss Princess on the pumpkin, too cute! If I run across any extra hours, I will share them with you! What a wonderful pair of outfits, Martha!!!!! I love them, and I love the details you provided!!!!! Oh, and that big girl in the pumpkin patch? When did she get so grown-up? Everything you do is absolutely wonderful! Those are just precious and perfect! Now if that isn't just the CUTEST!!! As always, your attention to details amazes me! Beautiful work all the way around! They are just adorable! I think I just have to make the little boy's outfit for my great grandson! Princess is precious! Know that you're enjoying her immensely. Everyone has already said it so well, but these are just the most adorable outfits! 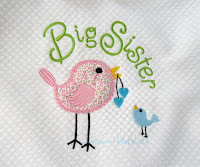 I hope everything goes smoothly for your daughter as she approaches the birth of her little boy. Prayers for a quick and safe delivery. 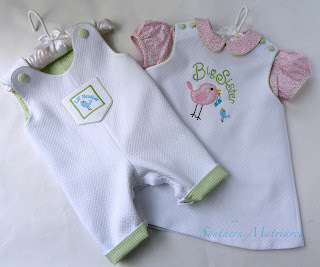 I just have to make the little boy's outfit for my great grandson!